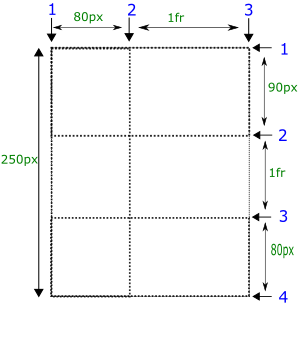 CSS grid-template-rows property defines the rows with their sizes. Their sizes are fixed or calculated automatically by row sizing functions. We may use named grid lines (in between the rows) to place an item within a grid otherwise use default numbered grid lines. In the above example, #item1 occupies space from grid-line 2 to 4 i.e. two rows (1fr, 80px). 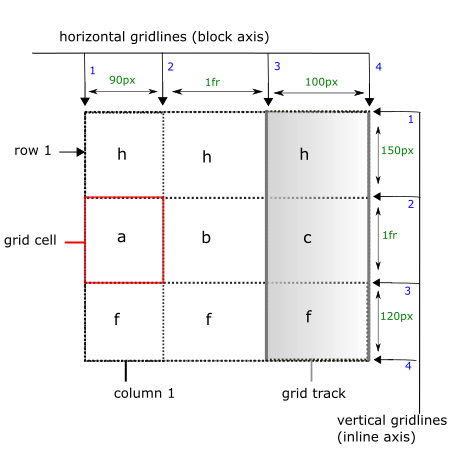 The grid framework to understand the layout of a grid. The fr unit, represents fractional flexible length. grid rows repeat function to fit the content within grid or to fill the grid automatically. row span to extend the placement of item to more rows. At the end we'll see both grid rows and columns. We can use different kind of row lists as the value. We'll discuss these row lists completely. There are no grid rows within a grid. The value of grid-template-rows consists of track size with their grid line names (optional). And the size of each track is fixed. There might be repetition of rows in this row list. See the syntax given below. track-repeat means syntax on right side may be repeated for more rows. See the example given below. The above given example is the updated version of numbered grid lines but with named grid lines. When there are two consecutive grid line names, they are merged i.e. [header-end] [main-start] can be written as [header-start main-start]. auto-row-list automatically defines rows of different heights. And the height is determined by the track sizing functions such as length-percentage of grid height, minimun or maximum height of grid item within a row. The first row takes 20% of the total height of grid. The second row takes remaining space after 20% and min-content. min-content means that it takes the contribution from the largest minimum height of an item present in that row. Its syntax is the same as track-list but it provides track sizing functions that automatically determine the size of the rows. track sizing functions are given below. length-percentage determines the size of a row relative to the height of grid container. For example, 30% row size means that row takes 30% of the height of grid container. min-content represents the minimun height of the grid item present in the row. It means that the row height should be greater than or equal to minimum height of a grid item. max-content represents the maximum height of a row. 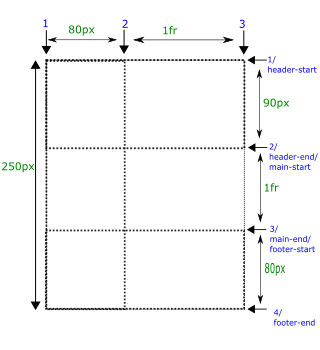 The row height should be less than or equal to the maximum height of the grid item. minmax function restricts the height of a row to the min and max values i.e. the height of a row should be greater than or equal to min value of an item and less than or equal to max value. It is flexible length. fr unit represents a fraction of the grid container. It is obtained by subtracting the height of other fixed or fractional sized rows from the total height of grid. 'auto' value automatically determines the height of a row. It represents the minimum (in case of minimum) or maximum (in case of maximum) height of a grid item in this row. It is applicable to all of the elements including pseudo elements (::before, ::after, ::marker). The grid-template-rows property has been covered up completely. If you are an advanced learner and want to get more on grid-template-rows property, continue to the remaining part otherwise skip to the next tutorial. We can use repeat() function to repeat grid rows instead of manually defining the rows. There are two arguments in the repeat() function. First argument of repeat() function may include a positive integer, auto-fill or auto-fit. The second argument accepts the rows that are repeated. Positive integer as the first argument represents the number of times the second argument should be repeated. See the example given below to understand the repeat function. The above given row list is repeated three times. auto-fill automatically repeats a row list (given as second argument) to fill the grid automatically without overflowing and and the remaining space represents a flexible row i.e. it can contain as many grid items as possible. In the above example, There are total 11 grid lines and 10 rows. The remaining space of 10px (from grid line 10 to 11) represents 10th row and it is flexible only i.e. the content can cause the row height to be greater than 10px. auto-fit is the same as auto-fill except that it fits content (rows that are currently used by items) within grid starting from the top of the grid without leaving any space. In this case, the remaining space also represents a flexible row only. It can occupy all the space of grid (if available). We simply specify row heights as the value to specify different rows within a grid. '1fr' represents a fraction of the total height of the grid. There are four vertical ([1-4]) and three horizontal ([1-3]) grid lines in the above example. #item1 occupies two rows i.e. '1fr' and 150px. A track is space between two adjacent vertical or two adjacent horizontal lines. A track may also be called as row. Here a track list means a list of rows. In this method, we use grid line names instead of numbered grid lines to place the items within the grid. See the example in the values section.